My dear friend took her adorable young children to the local aquarium recently. I heard later that an adult in the crowd was so frustrated by their lot in life that they felt justified in bullying her six year old daughter. When my friend came to her daughter’s defense this woman tried to pick a fight with her! I feel profoundly offended for this sweet child and her mother. The world is changing. It used to be that we respected our elders and somehow the shift has turned so that some of our elders feel like they can vent on small children; like it will somehow make them feel better. It won’t. 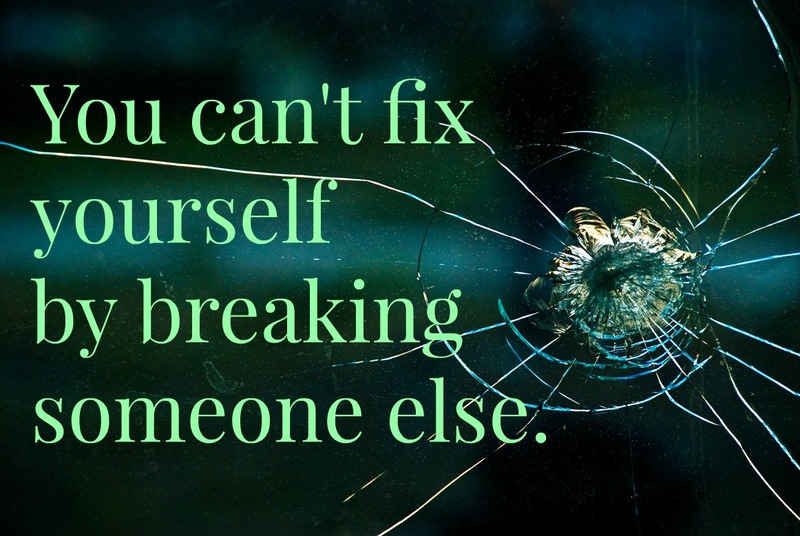 You can’t fix yourself by breaking someone else. I recently overheard another friend telling a story about her beautiful teenage daughter. This girl has been in beauty pageants. She carries herself with the grace of a princess. And even dresses up like one to help host gatherings for terminally ill children. There was an older woman and her adult daughter nearby when this girl made an honest mistake. Not only was the older woman rude, but she went out of her way to track down this teenager to share her caustic comments. The woman’s comments were so cutting and offensive that I was stunned! Worse, they were said in a house of God where one would hope she would have had some self control. And finally, it has bothered me forever that people use social networking to start fights and belittle one another. Some notable celebrities and bloggers have even removed pictures and posts because of all the nasty comments. Why people? Are we so bored with our lives or so inherently nasty that this is what we do behind closed doors? I’m disappointed! My brother posted a comic on Facebook recently that said essentially: “The Internet- an infinite source of information that we use to look at pictures of cats and pick fights with strangers.” I laughed at his post, it’s hilarious because it’s true! I think of these three experiences and I ask myself what happened to spreading some joy into the world? It seems to me that in this world of ours we need each other. We need the love of the Savior in our lives, and in our relationships. And we need to teach the next generation how to find the peace we may have been denied. So how do some people justify breaking other people in an effort to make themselves feel better? In October 2008 Elder Dieter F. Uchtdorf (a high ranking Mormon official) told a story. There was a grand piano that needed to be moved from the chapel to the cultural hall next door. A group of men gathered to try to lift it, but as you can imagine it was a huge job. After many tries it was suggested that the men stand close together and lift where they stood. It worked! And the piano was easily transported. I love Elder Uchtdorf! He said it so well. President Dieter F. Uchtdorf, Lift Where You Stand, October 2008 General Conference of The Church of Jesus Christ of Latter-day Saints.